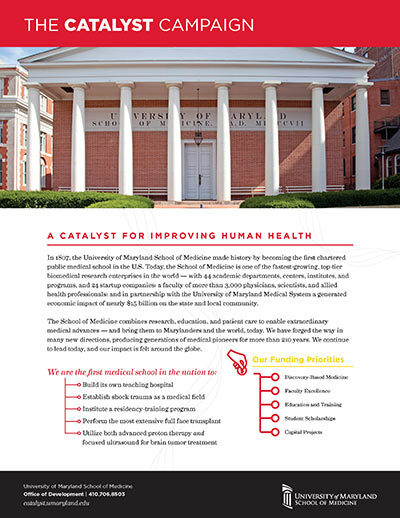 In 1807, the University of Maryland School of Medicine made history by becoming the first chartered public medical school in the U.S. Today, the School of Medicine is one of the fastest growing, top-tier biomedical research enterprises in the world — with 43 academic departments, centers, institutes, and programs, and 24 start-up companies; a faculty of more than 3,000 physicians, scientists, and allied health professionals; and, in partnership with the University of Maryland Medical System, a generated economic impact of nearly $15 billion on the state and local community. The School of Medicine combines research, education, and patient care to enable extraordinary medical advances — and bring them to Marylanders and the world, today. We have forged the way in many new directions, producing generations of medical pioneers for more than 210 years. We continue to lead today, and our impact is felt around the globe. Since its inception in 1807, the School of Medicine has made numerous advances that have dramatically and measurably impacted and improved people’s lives. Each day, our faculty treat complex medical conditions using the most innovative technologies and advanced therapies. Each day, we conduct groundbreaking biomedical research and make discoveries that will lead to novel treatments and cures. Each day, we bring together the world’s leading experts and the brightest minds to provide an unparalleled combination of educational resources to better prepare students for their medical careers. Each day, the School of Medicine makes the extraordinary possible. A breakthrough could happen tomorrow. This is why it is of the utmost importance that we continue to advance this integral work today. You can be the catalyst. Join us in being a CATALYST for improving human health in Maryland and beyond. 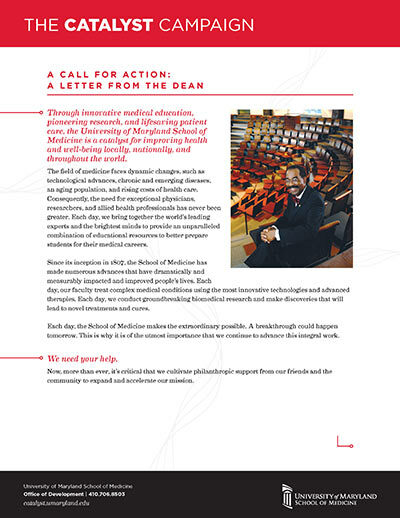 Through innovative medical education, pioneering research, and life-saving patient care, the University of Maryland School of Medicine is a catalyst for improving health and well-being locally, nationally, and throughout the world. Now, more than ever, it’s critical that we cultivate philanthropic support from our friends and the community to expand and accelerate our mission.